The statewide gas price average in Texas is now $2.42 for a gallon of regular unleaded fuel, according to the AAA Texas Weekend Gas Watch. That price is seven cents more than last week and is 31 cents more per gallon compared to this day last year. Of the major metropolitan areas surveyed in Texas, drivers in Midland are paying the most on average at $2.61 while drivers in San Antonio are paying the least at $2.30 per gallon. The national average price for a gallon of regular unleaded is $2.65, which is eight cents more than this day last week and 35 cents more than the price per gallon at this same time last year. With the arrival of spring, gas prices immediately became more expensive across the country. Right now the market is beginning to transition from winter-blend gasoline to summer-blend, which is usually more expensive to produce. In Texas, drivers are seeing the largest weekly increase in Abilene, where regular unleaded gasoline is 17 cents more per gallon than last week. The average family-sized vehicle has a 14-gallon gas tank. This means Texans are paying around $34, on average, to fill up. 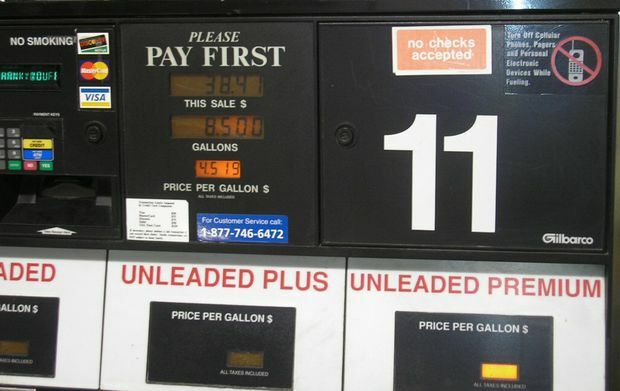 Gas prices are expected to increase in the coming weeks, according to market analysts. In the south and southeast regions of the U.S., gas prices have increased in every state on the week. Florida is paying the most in the region at $2.64 per gallon of regular unleaded fuel. To help members and non-members identify quality auto repair shops that can assist in the maintenance and repair of their vehicles, AAA offers the Approved Auto Repair program as a free public service. AAA-approved repair facilities meet and maintain high professional standards for training, equipment, cleanliness and customer service. Motorists can look for the Approved Auto Repair sign at local auto repair facilities, or search for a nearby AAA-approved shop online at AAA.com/Repair. AAA Texas branch offices throughout the state can be found by visiting www.AAA.com. Follow AAA Texas on Twitter: @AAATexas and Facebook: www.facebook.com/AAATexas. Find additional news from AAA Texas in our online newsroom at http://tx-aaa.iprsoftware.com/.